Cloudflare provides DDoS mitigation, internet security services in between website visitors and the server on which content is being hosted. At the moment Cloudflare is one of the most popular free CDN service providers. Select Suitable Cloudflare service plan (Free is also suitable). Proceed with current DNS record scan, by pressing "Continue" button. 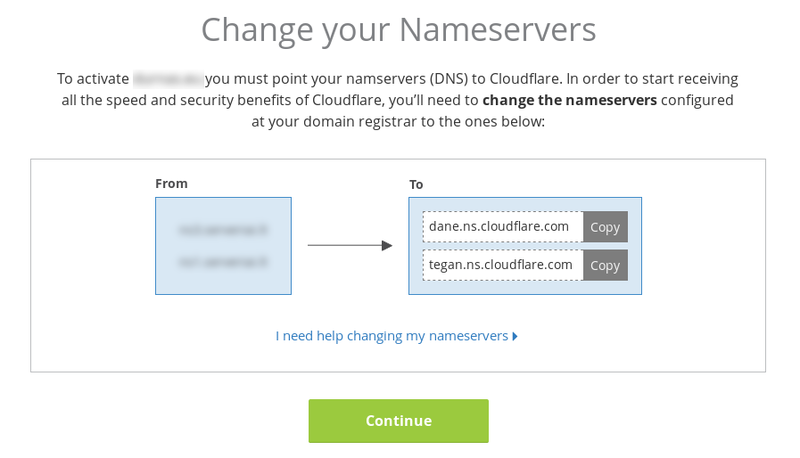 Set the nameservers that you will receive, in this example it was dane.ns.cloudflare.com and tegan.ns.cloudflare.com, however it is very likely that for your domain it will be different. This change has to be done from your domain registry (company on which you have registered your domain). Usage of both Nameservers are mandatory. The change will be fully saved after TTL of the DNS servers will pass. After the change you will have to wait until it will be completed. Cloudflare system will automatically refresh the information of changes. Manual check initiation is also possible by pressing "Recheck Nameservers" button. If you have closed domain management panel it can be re-opened again by selection "Overview" menu option and choosing the domain. 3. Change of attacked IP address. 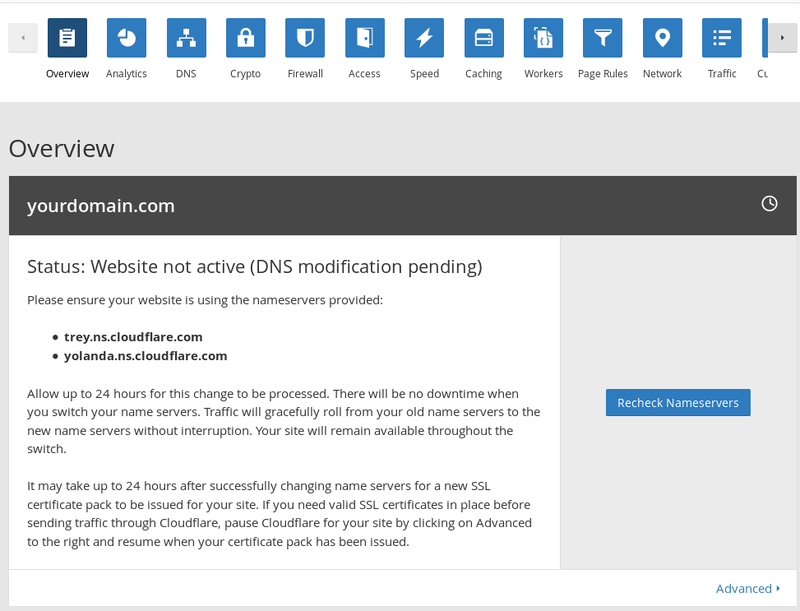 Check if the domain is fully protected by the Cloudflare service. If protection is active - "Overview" section should be in green font. When the Cloudflare protection will be active, as seen in the image below, that will hide your server IP when checking the domain, under Cloudflare reverse proxy. FROM THIS STEP DO NOT TURN OFF THE CLOUDFLARE PROTECTION THAT HIDES THE IP ADDRESS. The protection is required, because the old IP that was attacked before at this moment is still related to your server. To solve this, you should order additional IP address for your VPS. After you will make the payment for the IP address order, you have to open a ticket from your client area with request of changing old IP address with the newly ordered. This is required that old IP, that is under attack, would no longer point harmful traffic to your server. 4. Final changes for domain DNS zone records.